Advancing an ambitious research agenda while providing the latest science-based information for people of all ages on the spectrum is our focus at the ARI. 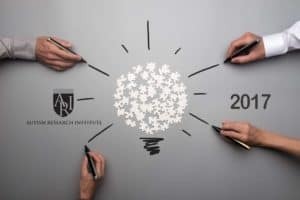 In 2017 we did so through our annual think tank, in-person and online educational events and courses, and free webinars, and by funding the studies that hold the most promise for making a diﬀerence in the lives of people with autism. While the causes of ASD remain unclear, recent scientiﬁc advances challenge the traditional view of autism as an untreatable disease—as one that is genetically hardwired. These developments support the position that ARI has always maintained: autism is treatable. ARI continues to pioneer research, outreach, and cooperative eﬀorts with other organizations worldwide. ARI awarded more than $200,000 in grants to scientists whose work will have a direct impact on the lives of those on the autism spectrum. The funds supported research in immune, gastrointestinal, metabolic, neurologic, and sensory issues. We sponsored a major think tank, attended by researchers and medical clinicians. In order to make progress in the ﬁeld, ARI knows it is critical for scientists and experienced clinicians to meet and discuss issues related to treatment. ARI helps fund two tissue banks, including a whole-body tissue bank for the National Institute of Child Health and Human Development at the University of Maryland and a gastrointestinal tissue bank at the Digestive Function Laboratory Repository at Massachusetts General Hospital in Boston. We co-sponsored the first think tank in North America on aging in autism. Numerous topics were discussed including medical co-morbidities, sensory and cognitive abilities, and the need for longitudinal studies. ARI offers, in joint providership with the Cleveland Clinic, complimentary AMA PRA Category 1 Credit™ to physicians and the general public. This year we premiered talks on anxiety and immunology. Connecting physicians to improved standards of care is crucial to amplifying understanding of the medical nature of the disorder. Our YouTube channel offers free access to experts with up-to-date webcasts on medical support and educational videos, social stories, and selected talks from past conferences. Users have tuned in for more than 300,000 viewings at bit.ly/autism_education. ARI hosts live webinars featuring top researchers and treatment professionals in partnership with The Johnson Center for Child Health and Development. The topics include research updates, diet, nutrition, ABA, assessment, educational therapies, adult issues, and much more. Participants can receive a free Certiﬁcate of Attendance for most webinars. Visit our webinar portal at www.ariconference.com. ARI offers a hotline for parents and professionals, who can reach a live person for information and support. ARI publishes a bimonthly e-newsletter, Clinical Research in Autism, for obstetricians, pediatricians, and nurses who want to keep up to date with research relevant to their practice. For the fifth straight year, we co-sponsored a major international conference in Moscow. ARI continues to translate many of our key articles, as well as our Autism Treatment Evaluation Checklist (ATEC), into diﬀerent languages—the ATEC is now available in 20 languages online. On average, more than 150 users per day complete ARI’s ATEC.